You may not be able to bask in the sun during the winter season, but that doesn’t mean there’s no fun to be had. Many residents turn to snowmobiles and other winter activities to stay active and to have some fun in the frigid winter weather. With these fun activities comes a heap of responsibilities. Snowmobile riders are asked to be cautious and to take the proper safety precautions to avoid a potentially fatal snowmobile accident in Massachusetts, just like the recent snowmobile accident that happened in the White Mountain National Forest. The recent snowmobile accident in New Hampshire took the life of a 51-year-old Massachusetts man. The North Billerica resident was involved in a snowmobile accident at roughly 10:00 p.m. when he lost control of the vehicle while making a turn and slammed into a bunch of trees. He was the last rider ion a group of four. The snowmobile riders ahead of him noticed the man’s headlights shining all over the place and the crew stopped to help. Reportedly, the man was pronounced dead at the scene. Officials attempted to resuscitate the man, but his injuries were far too severe, according to the Boston Globe. The accident is still being investigated, but officials report no foul play is suspected. Our Boston personal injury attorneys enjoy the outdoors, too. But there are a few safety precautions that both you and I should follow to help to prevent winter accidents, including snowmobiling accidents. 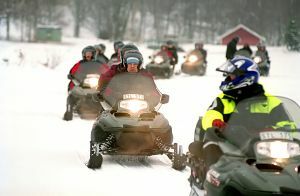 Nowadays, snowmobiling is a winter sport that is enjoyed by more than 2 million people in the U.S. Still, these vehicles can weigh in excess of 600 pounds and can travel at speeds of up to 90 miles per hour. Every year, roughly 200 people die and another 14,000 people are injured on snowmobiles. Some of the causes of these accidents can include driver inexperience, alcohol and excess speed. Injuries sustained from these types of accidents can be life altering. These injuries are often extremity fractures but can also involve organ systems. Just like car accidents, snowmobile accidents can result in multisystem trauma — head injuries are the leading cause of death. -Complete a snowmobile safety course. -Always ride with the highest degree of caution, especially when traveling across frozen waterways. -If you don’t know, don’t go. -Always ride with a buddy. Never travel alone. -Never drink and ride. Alcohol hinders your ability to react and your judgment. -Slow it down. Fast speeds increase stopping distances and leave less room for mistakes. Slower speed equals more control. -Never exceed 40 miles per hour when traveling at night. Speeds above 40 mph cause operators to override their headlamps. -When riding in a group, always follow safely. Allow at least 2 or 3 seconds of space between you and another snowmobile. -Respect private property. Stay on marked trails. If you or someone you love has been injured in a Boston snowmobile accident, contact Boston Accident Lawyer Jeffrey S. Glassman for a free and confidential appointment to discuss your rights. Call 877-617-5333.